BERLIN, Germany -- Germany's Angela Merkel has said a US official's apparent insult of the EU's efforts to mediate in the Ukraine crisis is "totally unacceptable". 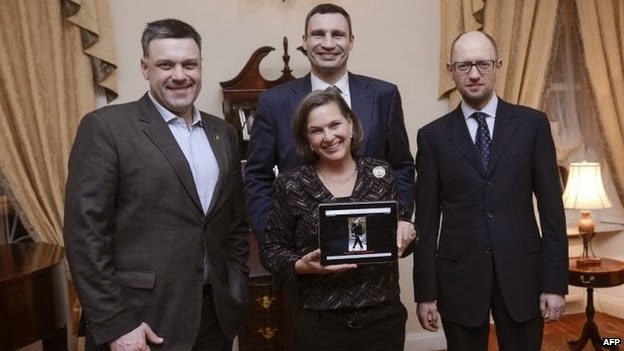 On her visit Ms Nuland met opposition heads (L-R) Oleh Tyahnybok, Vitaly Klitschko and Arseniy Yatseniuk. A recording of the exchange was posted online, with the US hinting at Russia's involvement in bugging and leaking it. The EU and US are involved in talks to end months of unrest in Ukraine. In Kiev, Ms Nuland - an assistant secretary of state - said she would not make a public statement on the matter. She described the leak as "pretty impressive tradecraft. [The] audio quality was very good". The state department said she had apologised in private to EU officials. Mass anti-government protests erupted in Ukraine in late November after President Viktor Yanukovych refused to sign a far-reaching association and trade agreement with the EU - under heavy pressure from Moscow. Russia has been widely accused of using its economic clout to persuade Mr Yanukovych not to pursue closer ties with Brussels. Russia has itself accused Washington and the EU of meddling in Ukraine. German government spokeswoman Christiane Wirtz said Ms Merkel fully supported the work done by EU foreign policy chief Catherine Ashton to find a solution to the crisis. "The chancellor finds these remarks totally unacceptable and wants to emphasise that Mrs Ashton is doing an outstanding job," Ms Wirtz said. The alleged conversation between Ms Nuland and the US ambassador to Ukraine, Geoffrey Pyatt, appeared on YouTube on Thursday. The video, which lasts for four minutes and 10 seconds, was entitled "Maidan's puppets" in Russian - a reference to the square in Kiev, where pro-EU protests have been held for months. A transcript of the whole conversation was also posted in Russian. At one point, the female speaker mentions the UN and its attempts to find a solution to the Ukraine stand-off. She says: "So that would be great, I think, to help glue this thing and have the UN help glue it and you know. The male replies: "We've got to do something to make it stick together, because you can be pretty sure that if it does start to gain altitude the Russians will be working behind the scenes to try to torpedo it." The two people also discuss their dealings with Ukraine's three main opposition leaders - Vitaly Klitschko, Arseniy Yatseniuk and Oleh Tyahnybok and their attempts to encourage them to work together. However, the female speaker says that Mr Klitschko, the former heavyweight boxing world champion, should not be in any new government. She adds: "I think Yats [Arseniy Yatseniuk] is the guy who's got the economic experience." US officials refused to confirm or deny the tape's authenticity and EU officials refused to comment. However, state department spokeswoman Jen Psaki suggested that the tape could have been leaked by Moscow, noting that a senior Russian official was one of the first to draw attention to the audio. "We think this is a new low in Russian tradecraft. This is something they've been actively promoting, posting on, tweeting about," she said. Russian government aide Dmitry Loskutov, who was one of the first to draw attention to the posting, told the AP news agency that neither he nor the government had leaked the conversation. Moscow has promised a $15bn (£9.2bn) loan to Ukraine but said it would not be released in full until the formation of a new government in Kiev. Ukrainian Prime Minister Mykola Azarov and his cabinet resigned last month as President Yanukovych sought to calm street protests.